The World Economic Forum on ASEAN (WEF ASEAN) plenary session “ASEAN Priorities in the Fourth Industrial Revolution” officially opened in Ha Noi on September 12 with Prime Minister Nguyen Xuan Phuc together with leaders of ASEAN, WEF and other countries in attendance. The WEF ASEAN themed “ASEAN 4.0: Entrepreneurship and the Fourth Industrial Revolution” is the largest multilateral diplomatic event hosted by Viet Nam this year. The prestigious forum in the region brought together more than 1,000 delegates who are leaders of regional countries, representatives of international organizations and the world’s leading groups. The event is seen as a rendezvous for 80 leading startups in ASEAN, most of them are start-up accelerators, adventurous investment funds, technological experts and media leaders. With more than 50 sessions, leaders and leading regional and international businesspeople debate and share policies, ideas and initiatives for startup development so as to make the most of opportunities for stronger cooperation in dealing with the 4th industrial revolution-related issues faced by ASEAN member states and beyond. In his key-note opening speech, Prime Minister Nguyen Xuan Phuc highlighted the fourth industrial revolution as a source of creativity, saying 4.0 revolution brings about a wealth of opportunity to ASEAN state members. First is to create a breakthrough in productivity across the five major industries. Second is to promote inclusive growth towards the UN goal of sustainable development and third is to boost small and medium sized enterprises (SMEs) that are the backbone of ASEAN, he said. According to many experts, 4.0 revolution will secure the livelihood of people, but the challenge of increasing income gap and the risk of social instability is also a matter of great concern, he said, noting that ASEAN is proud to have a pioneering Singapore in the digital economy, which has recorded a lot of achievements over the recent past. The PM also suggested a number of priorities targeting digital connections and cooperation on data sharing. He underlined the need to ensure the harmonization of the business environment, institutions and law, find talents and highly skilled technicians, and establish an ASEAN education network and lifelong education system. “In the context of revolution 4.0, we need to join hands for further development, placing people at the centre of development. ASEAN has affirmed its central role in the region,” Phuc added. In addition, there will be a host of sideline events aiming to promote Vietnam’s image and enhance business connectivity, including a banquet welcoming WEF ASEAN delegates, a cultural gala and tours of Ha Long Bay. It is worthy of note that Prime Minister Nguyen Xuan Phuc is also set to attend the Viet Nam Business Summit within the framework of the WEF ASEAN on September 13. The WEF ASEAN 2018 gives the chance to step up cooperation between Viet Nam and the world’s leading financially and technologically strong partners, who are highly interested in investments in the country, thus helping to boost market expansion and take advantage of high quality capital sources and advanced technology to serve the process of economic restructuring and growth model reform. 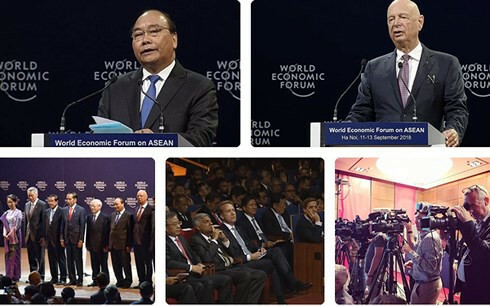 As the host and co-organizers of the WEF ASEAN, Viet Nam has earned international plaudit for putting forward revolution 4.0 in the event’s theme as well as integrating other issues of Viet Nam and ASEAN’s concern into the agenda such as innovative startup, infrastructure and smart cities, labour and employment in the fourth industrial revolution.